This week’s edition of the Orange County Business Journal featured an article that takes “stock of how [its] picks of a year ago panned out.” Instead of providing the entire article, I’m only providing the final section, which deals with Wayne Quint, the president of the Association of Orange County Deputy Sheriffs (AOCDS). Wayne Quint is keeping busy right now with an attempt to convert his union into an agency shop, which would require that nonmembers of the Association of Orange County Deputy Sheriffs (and there are many) would have to pay a fee to cover collective bargaining costs. We’re receiving correspondences from members and nonmembers of AOCDS venting their opposition to this maneuver. On a bright, comparative note, the Orange County Professional Firefighters Association, Local 3631, approved a contract last week with the Orange County Fire Authority that is similar to the one that was recently approved by AOCDS (see http://www.ocregister.com/news/union-278618-firefighters-ocfa.html?nstrack=sid:871640%7Cmet:102%7Ccat:5342057%7Corder:1). Today’s Look Back is a polite reminder that the property tax due date is this Friday. 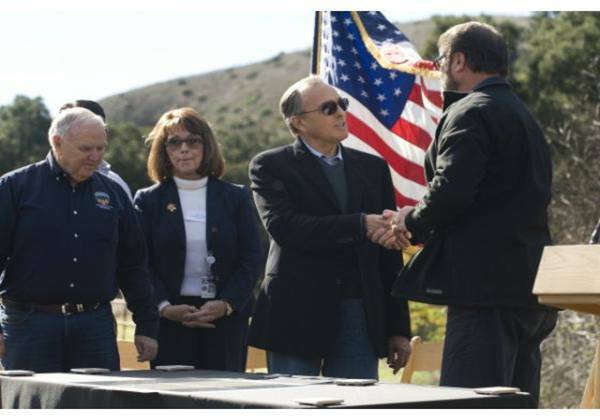 A week ago Tuesday, the Board of Supervisors had the privilege of sharing in a deed signing ceremony with Donald Bren of The Irvine Company on a portion of the 20,000 glorious acres that he gifted to the County. It was a special opportunity to thank Mr. Bren personally. The OC Register took a few photos and posted them on its website; two of them are provided below. Wayne Quint, president of the Association of Orange County Deputy Sheriffs, had to play a lot of defense in 2010. But our government person to watch managed to protect his membership, for now, from big cuts in jobs or benefits. In February, the deputies and county supervisors agreed to a three-year contract that froze wages, required deputies to kick into their retirement plan and raised the retirement age for new hires, in exchange for the county paying more for healthcare. Saying the savings were inadequate, Supervisor John Moorlach cast the lone dissenting vote against the deal. Quint’s union backed losing candidates Bill Hunt for sheriff and Harry Sidhu for supervisor, and passed on a rematch against Moorlach, who won unopposed. While some professional safety groups around the state backed gubernatorial candidate Meg Whitman, the California Coalition of Law Enforcement Associations, which Quint also heads, endorsed winner Jerry Brown. In September Quint got a judge to halt, pending appeal, Sheriff Sandra Hutchens’ plan to hire more civilian jailers. Other issues remain, including an ongoing court challenge by the Board of Supervisors to the retroactive pension benefits granted to deputies in 2001, set for a hearing next month. And economic forces continue to squeeze the sheriff’s budget. Quint has his members’ support: He recently was re-elected president by both the deputy sheriffs association and the California coalition. Orange County Supervisors Bill Campbell and Patricia Bates look on as Irvine Co. Chairman Donald Bren shakes on the deal with Supervisor John Moorlach after they signed a deed gifting OC Parks 20,000 acres of land. 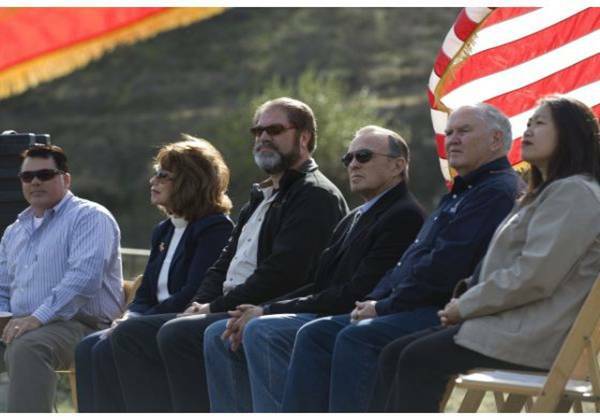 range County Supervisors joined Irvine Co. Chairman Donald Bren Tuesday, November 30, 2010 in a ceremony transferring 20,000 acres of rugged land from the Irvine Co. to OC Parks. From left are Shawn Nelson, Patricia Bates, John Moorlach, Irvine Co. Chairman Donald Bren, Bill Campbell and Janet Nguyen. Orange County Treasurer-Tax Collector John Moorlach has begun accepting property-tax payments by “virtual check” via the department’s Web site, www.oc.ca.gov/treas/. The check produced by this electronic transaction will appear on the taxpayer’s monthly bank statement.